In its report on The Human Rights Implications of Brexit, the Joint Committee on Human Rights (JCHR) expresses great fear that the UK’s withdrawal from the EU will do significant damage to the constitutional framework for protecting human rights. 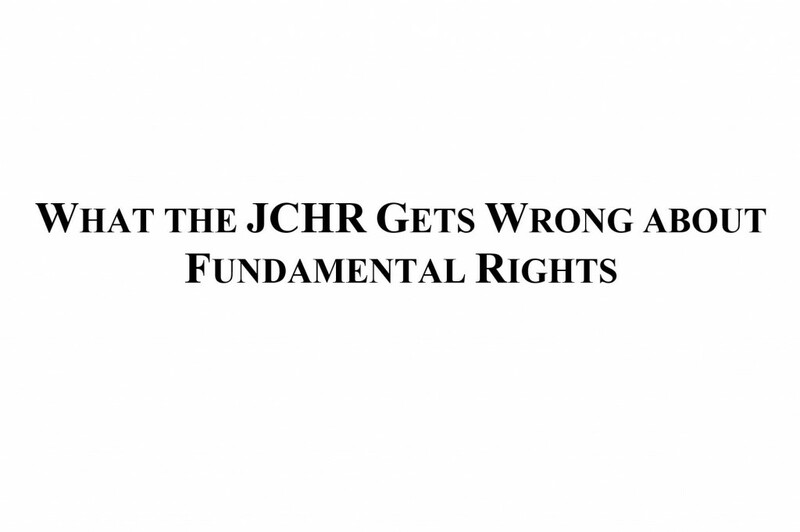 For reasons outlined in our submission to the JCHR, the report’s fear is misplaced and betrays important misunderstandings about human rights and their foundations. Fundamental human rights are not created by treaties with foreign powers. They are moral truths that states should recognise and to which they should give effect. The UK has long had an enviable reputation for securing rights and for doing so by way of the ordinary processes of parliamentary democracy and common law adjudication. The obvious answer to the JCHR’s anxiety about how rights will be protected after Brexit is that they will once again be secured by a sovereign Parliament, acting within a mature political tradition and answerable to the electorate, and by an executive that is accountable to Parliament and subject to the ordinary law of the land, including the rulings of independent courts. The report is wrong to assert that membership of the EU has been pivotal to the UK’s record of rights protection and that withdrawal puts the future of rights protection in doubt. Equally mistaken is the JCHR’s unwarranted assumption that the UK would not have acted to secure certain rights but for EU involvement. On top of this, the JCHR wrongly assumes that rights are best protected by supranational rights adjudication. Rather than being viewed as a guardian of rights, the Luxembourg Court is best understood as a motor of integration which almost always resolves legal questions in a pro-Union – i.e. more rather than less integrationist – fashion. Its expansive interpretations of the scope and content of EU fundamental rights should be seen above all as policies strengthening and expanding its own jurisdiction and its reach into the national laws of member states. The basic point of Brexit is that UK institutions will now be responsible for how the UK is governed. It is striking that the JCHR shies away from this responsibility by lamenting the prospect that developments in EU law and the case law of the CJEU will no longer automatically take effect in the UK. The Committee’s fear about the future of the EU Charter of Fundamental Rights should be seen in this light. The Charter’s scope is uncertain and its content is vague. It is a vehicle for a great expansion of judicial power and it should have no place in UK parliamentary democracy. The Great Repeal Bill should bring to an end its continuing force in our law. After Brexit, it will be for Parliament to decide whether to depart from the legal status quo. It is therefore absurd for the JCHR to demand that before triggering Article 50 the Government should itemise the rights that EU law protects and its intentions in relation to each of them. This would be a colossal waste of time and wholly premature. The Government cannot itself repeal laws it thinks undesirable – it will be for each successive Parliament to decide how or if to change the law. The JCHR draws attention to the risk that Parliament may empower ministers to change the law by way of sweeping Henry VIII clauses. This is a real risk and warrants caution. However, the complexity of law reform after Brexit will require a combination of primary and secondary lawmaking and the trick will be to confine and focus the latter, not to eschew it altogether. The main substantive recommendation in the Committee’s report is that the Government unilaterally guarantee permanent residence to all those EU nationals legally resident in the UK. To do otherwise, the JCHR suggests, would be wrongly to treat fundamental human rights as bargaining chips. However, there is clearly no fundamental human right on the part of all EU nationals resident in the UK at present to remain permanently in the UK. The rights of legal residence such nationals now enjoy are obviously rights that are contingent on the continuing force of the EU treaties. The JCHR’s proposal is to confer a novel right on EU nationals. The right is not less novel simply because Article 8 of the ECHR is likely to be called in aid to challenge attempts to uphold clear migration law. Notwithstanding the JCHR’s muddled legal analysis, it would of course be very wrong to disrupt the lives of the many EU nationals who have settled here. And no one has proposed doing so. However, it may well be premature – or extravagant – to confer new rights of permanent residence on all EU nationals now lawfully resident in the UK unilaterally. It would be premature without first considering reciprocity with the relevant member states, which may be necessary to discharge the responsibility of British authorities to secure the rights of UK citizens living abroad. It would be extravagant if it failed to distinguish EU nationals who are recently arrived from those who are long-settled and, especially, if it ignored the risk to others that some EU nationals may pose, risks that EU law has forbidden the UK from addressing. The JCHR is quite right that settling residence rights is very important. But as the JCHR itself notes, the Government agrees and is already making this a priority. The Government might usefully assure EU nationals resident in the UK that it intends to define and establish the right of EU nationals to remain, but nothing in the JCHR’s report provides any compelling reason for it to go further at this stage. Overall, the JCHR’s alarmism about human rights after Brexit is misplaced. Not only alarmist, the JCHR’s report rests on one mistaken assumption after another. Above all, it assumes without evidence that the UK would not have sought to secure certain rights but for our membership of the EU, which in turn leads it to wrongly assume that there will be a ‘net loss’ of rights protection following withdrawal from the EU. In this, the JCHR singularly fails to recognise the opportunity for withdrawal to improve the constitutional arrangements by which human rights are protected within the UK. No state has a perfect record, but the UK’s record of protecting fundamental rights is the match of most countries in the EU and beyond. Following Brexit, the JCHR itself will have an important role to play in the architecture of rights protection in the UK. We hope that at that time the JCHR will be less dewy-eyed about the EU and exhibit a better grasp of the proven capacity of our parliamentary democracy to respect and enhance human rights protection and the rule of law.